Winker & the 99 trim Turn 10 at Brainerd International Raceway. Photo © 1995 by Rick Corwine. Involved in motorsports since 1969, Tim Winker has had the opportunity to participate in such diverse forms of motoring as rallying, PRO Rallying, autocross, ice racing and road racing. Among the more presitgious events on his resume are One Lap of America (1990 and 1992) and The Alcan 5000 Rally (1991 Summer edition and 1994 Winter edition). 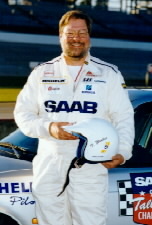 In October 1996, he was one of the drivers who helped Saab set 40 FIA records at Talladega Motor Speedway in several stock Saab 900s, with a record-setting fast lap of over 148 mph in a 2.5-liter V6. He began racing in SCCA's Improved Touring category in 1992 after taking the Skip Barber 3-Day Racing School. That first year he rented a Toyota Starlet in order to complete licensing requirements. For the 1993 season, he completed basic work on a Saab 99, purchased a couple of years prior for the purpose of going racing. 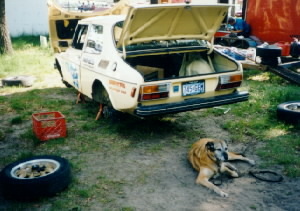 The Saab rolled over during qualifying, but due to the strength of Swedish steel, no windows were broken and the car was able to race the following day. In that first race in the 99, on a wet track, Winker placed 5th out of 12 cars in ITB, ahead of all the rear-wheel drive cars. In addition to racing in ITB, the same Saab has seen action in an SCCA Divisional PRO Rally [Headwaters 1995, 3rd in U2L], an SCCA Solo II, the Chippewa Trail SCCA National Touring Rally, and the 1996 St. Paul Winter Carnival Ice Race [4th overall, 2nd in Stock class]. During the 1996 season, Winker raced in only 3 events, all at Brainerd. Best finish in '96 was a 5th place. He took the 1997 season off to participate in Saab 50th Anniversary celebrations in Sweden and the U.S. The 99 was converted to PRO Rally use in 1998. It was driven by Tim's brother, Mike, at the Headwaters Divisional PRO Rally in May. Later in the year, Tim drove it at the Keweenaw Challenge Divisional Rally in Michigan, and at the 1999 Sno*Drift ClubRally in Michigan. Click here to read about those adventures. The 99 was sold to Jon Butzke in the Fall of 1999, who intends to use it for both racing and ClubRallies. Winker is contemplating several motorsports projects, including an ITB Saab 900S 16-valve, or vintage racing or rallying a 1969 Saab Sonett V4 or a 1960 SAAB 93F that rest (rust?) in the barn. Winker is ex-publisher of NINES, the Saab Club Magazine. Beginnning in 2001, he became the "voice" of the SCCA ProRally TV programs on Speedvision. He shares a 30-acre farm in Saginaw, Minnesota, with Diane Sargent, two dogs (Porter and Yeti), two cats (Tasha and Guibo), a Norwegian Fjord Horse (named Axel) and many chickens (most un-named). Winker is a member of Lake Superior Region SCCA. 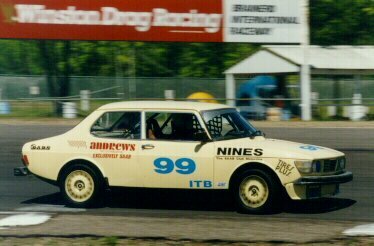 Foreign Affairs of Duluth, Inc.
Tim Winker at the 1996 Saab 900 Talladega Challenge. He was one of the 12 drivers who set a new 12-hour average speed record in the 2.5-liter V6 of 139.232 mph (224.072 kph). Winker set an individual fast lap during the run of 148.072 mph in the V6. NEXT: Other IT drivers who aspire to DAMN-IT.